We are pleased to unveil the recipients of the "Viking Awards" 2014, Wei Ning Shi and Damiano Ottaviani. The choice of the two students was made by the college’s selection committee based on academic achievement and community involvement. 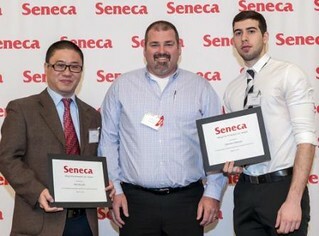 Steven Spearing (Regional Manager – Viking Ontario) had the opportunity to meet the two recipients of the "Viking Awards" at the Seneca College Award Ceremony on March 31th. Congratulations to Wei Ning Shi and Damiano Ottaviani!